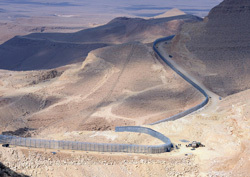 A general view of the border security fence along the Israel-Egypt border. TEL AVIV | Israel completed the main section of a $416 million fence along the Egyptian border on Wednesday [Jan. 2], a project that became more urgent after the fall of President Hosni Mubarak nearly two years ago. The 144-mile section of the 16-foot-high fence includes barbed wire, surveillance cameras and radar, stretching from the Gaza Strip to just north of Eilat. Israeli officials said the fence had already stopped the illegal entry of thousands of African migrants and lowered the risk of militant infiltration from the chaotic Sinai Peninsula. An eight-mile section through harder-to-infiltrate mountainous terrain is to be completed this year, a defense official said. Before construction began 2½ years ago, a few lines of barbed wire on rickety poles protected the border. The porous desert frontier became a threat for Israel after Mr. Mubarak’s fall weakened the security presence on the Egyptian side. 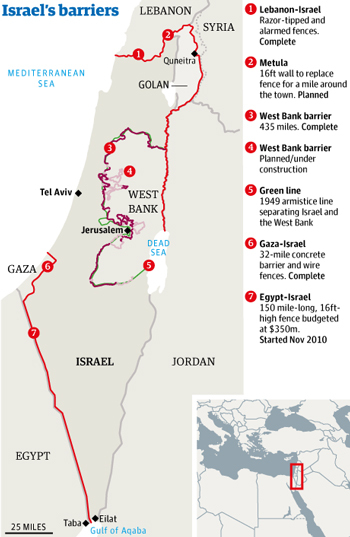 The plan to seal the border was accelerated after a deadly cross-border attack by militants on an Israeli passenger bus and jeep patrol in August 2011. Israeli Prime Minister Benjamin Netanyahu attended a ceremony with senior army and defense officials on Wednesday to mark the completion of the main part of the project. Some 2,153 African migrants entered Israel illegally in January 2012, according to government data. In December, only 35 entered, according to the data. “There hasn’t been one infiltrator who has reached an Israeli city in seven months,” Mr. Netanyahu said on the border Wednesday, at a ceremony marking the fence construction. TEHRAN | The Iranian government has launched its own video-sharing website to compete against Google’s popular YouTube whose content is deemed inappropriate by the Islamic regime, [Iran’s] state television reported on Sunday. A Facebook page dedicated to Mehr is providing links to some of its content, including music clips produced in Iran. Iran has consistently censored YouTube since mid-2009, in the wake of the disputed elections that returned President Mahmoud Ahmadinejad to power. It has also been trying to stop its population accessing a number of foreign websites authorities see as undermining the Islamic regime, including popular social networking sites Facebook and Twitter, as well as the online pages of many Western media outlets, blogs, [etc.]. The United States accuses Iran of seeking to implement an “electronic curtain” to cut its citizens off from the world. It has imposed sanctions on the regime involved in the censorship. The announcement came amid first steps by the Islamic republic to establish a walled-off national intranet separate from the worldwide Internet. Iran is working on rolling out its national intranet that it says will be clean of un-Islamic content. Authorities claim the “National Internet” would not cut access to the Internet. Many web users in Iran — half of whose 75-million strong population is connected — are used to getting around the censorship through the use of software known as a Virtual Private Network (VPN), whose sale is illegal in Iran. The United States accuses Iran of maintaining an “electronic curtain” to cut its citizens off from the world. 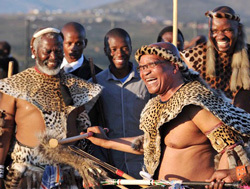 Mr Zuma is a Zulu who adheres to traditional practices, including polygamy. South Africa’s president, Jacob Zuma, has declared that having a pet dog is not African, and that black South Africans who buy a dog, take it for walks and to the veterinarian are copying white culture. Mr. Zuma, 70, was speaking at a traditional event in KwaZulu-Natal province, his first public appearance since being re-elected president of the African National Congress [in December]. He described people who love dogs more than humans as “having a lack of humanity,” Durban newspaper The Mercury reported. On Twitter, some black South Africans responded to Mr. Zuma’s latest comments by posting photos of themselves being “un-African” by walking their dogs. Mr. Zuma’s office said the message of the speech “was the need to decolonize the African mind post-liberation [from Great Britain].” “This is not to say that animals should not be loved or cared for. The message merely emphasized the need not to elevate our love for our animals above our love for other human beings,” a statement said. b) Why did completion of the fence become urgent after Egypt’s president Hosni Mubarak was ousted? b) In addition to wanting to block opponents of the regime from making their voices heard, and block Western ideas of freedom etc. from being accessible to Iranians, one of the other reasons Iran’s Islamic regime has blocked youtube is because it says the content is inappropriate. Many school districts in the U.S. (and some parents) have blocked youtube, declaring the content inappropriate. Do you agree with this assertion about youtube? Explain your answer. b) President Zuma issued a statement saying “This is not to say that animals should not be loved or cared for. The message merely emphasized the need not to elevate our love for our animals above our love for other human beings.” Do you think President Zuma meant what he said, or do you think his comments were misinterpreted as explained by his statement? Explain your answer.